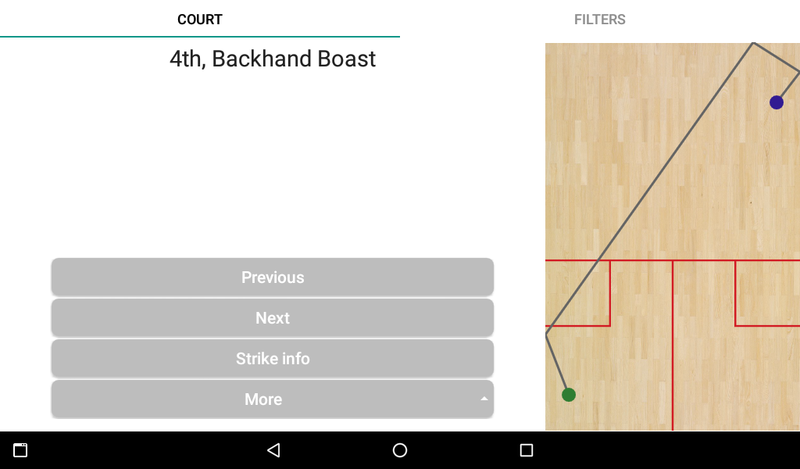 SquashTrack is an excellent and simple way to analyze squash game. 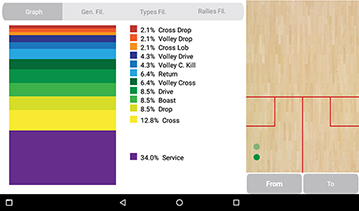 It makes possible to monitor in deep details all different shots, the player’s position on the court as well as starting and landing point of the ball. At the same time detailed statistics of winners, forced and unforced errors are disposable. The application offers a detailed analysis of an overall or one type of shot accuracy and efficiency. The results are displayed in text or variety of graphs, depending on the user’s choice. 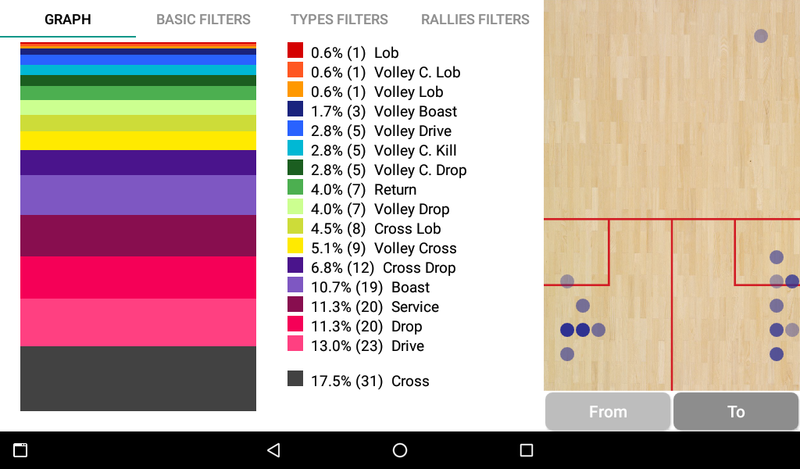 In one of the modes are also the rallies shown on the court area, either ball by ball, filtered groups, shot types or whole games and matches. The match or training recording is done on the touchscreen directly during the game or from video records. The application works in several different modes. 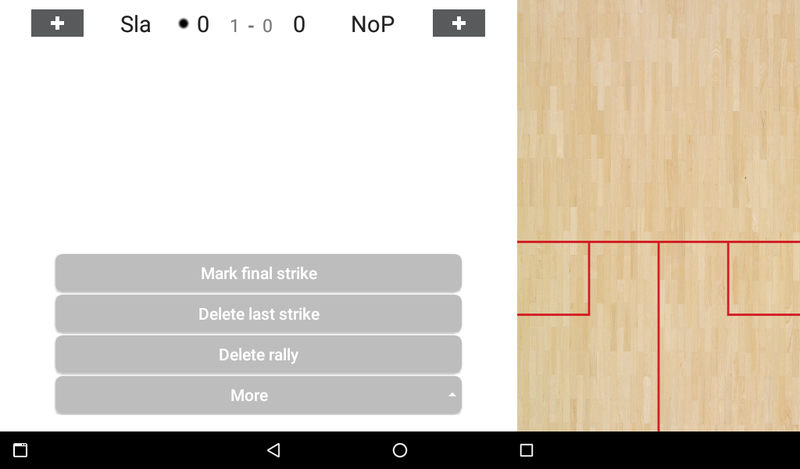 During the match, complete rallies or only the final points might be a recorded. A great feature is a quick game analysis between the games that allows fast analysis and setting of further tactics. For non-competitive purposes, there is a training and test mode. All records are stored continuously on the device, so the application can work without an Internet connection. Analyzes can also work in offline mode. As soon as the connection is available, records are uploaded to the server. A great feature is the ability to get the complete analysis in a pdf document. This can be emailed directly from the application and, if necessary, printed for consultation with a coach if needed. There is no limit in terms of volume of data or number of records per user. The data is backed up on the server, so even if the device is lost or replaced, it is still available. So it is possible to acquire the player’s overall history and progress as well as to follow his results with the same opponent over time. The application exists in two basic variants. The first one is designed for an individual player. Each player records his own matches and analyzes them. The coaching application allows coach working with his players and easily add or remove individual players. Currently, there is an Android App, the version for the other systems is being prepared. The application can be tested for free in full version for 30 days. Just a few clicks needed to record complete rallies or only final points, winners, forced and unforced errors. With the necessary accuracy on the whole court surface, it is possible to record from to where and kind of own as well as opponent shots. 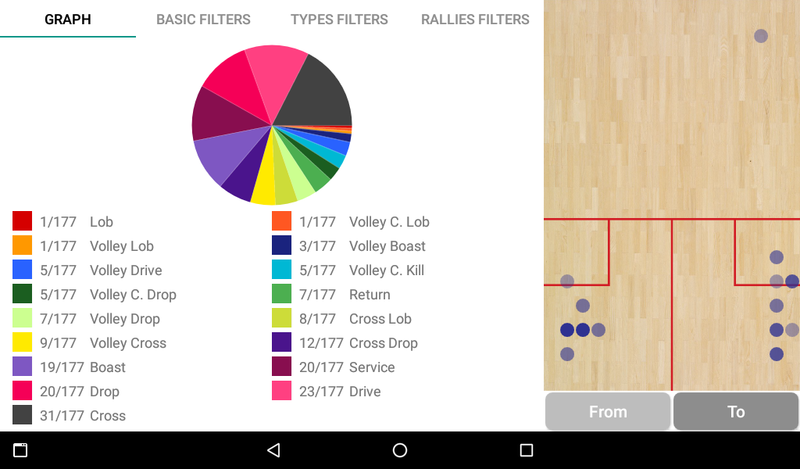 The application works with all types of shots including a service. It is possible to choose different types of recording depending on the type of use - match, training or test mode. 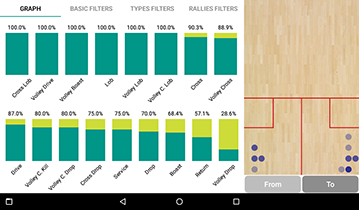 Matches are possible to record in two ways – ball by ball or only final rallies, both including a scoring. The training and test mode allows evaluating the training quality and efficiency without a scoring. The application provides a lot of analysis depending on the player and ball position, winners, forced and unforced errors. Squash game analyzing is possible in the form of a variety records, graphs or player/ball position on the court. Everything can be filtered in details even for the single-shot type or court location. The player or coaching application has no limitations in the number or volume of match or training records. 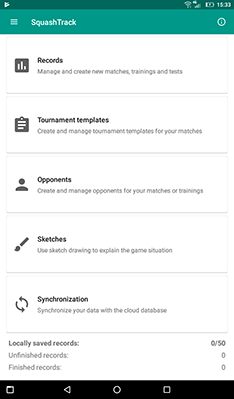 Each account has enough space for recording of matches and training over the years. The coach can add and remove players without limitation of the data volume. Two versions are available. The first type is for individual players and the second one for the coach working with his players. The player application allows working of a single user. The coaching one gives the opportunity to connect multiple players for mutual recording and squash game analyzing. Recording of matches or trainings to the application as well as analyzing are not dependent on the internet connection. Records are continuously stored on the device. It is possible to work with them in an offline mode. Once the connection is available, records are synchronized with the server. Each individual record contains location on the court where the shot was played and where the ball landed. By analyzing and filtering of sets, matches, or time period it is possible to identify the accuracy of each individual shot or an overall accuracy of the player. 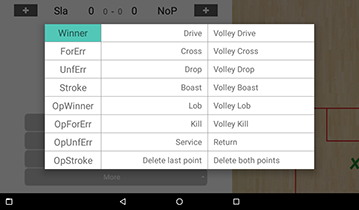 Winners, forced and unforced errors can be recorded in deep details for both, own and opponent’s shots. In this way is possible to identify not only winners and errors but also types of shots, player´s position and ball landing point. 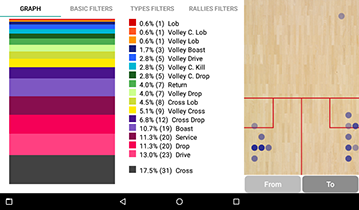 The analysis then detects strong and weak shots as well as locations on the court, which is an important basis for training and further matches. 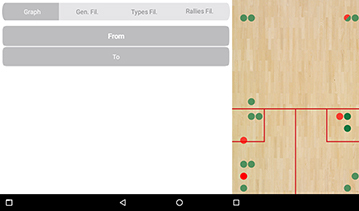 The application gives a unique opportunity of recording during the match and between the games quickly and clearly identify the strengths and weaknesses of both players as well as determine the tactics for the next game. There is also the option to sketch directly on the tablet screen to mark and explain the game situations. The complete analysis in a pdf document can be produced by one click. This document can be emailed directly from the application. A comprehensive document and complete statistics serve for consultation between the player and the coach. It is especially necessary if the coach has a larger group of players. To have an idea about this kind of analysis you can download a sample of the pdf file. The application offers a large number of different squash game analysis depending on the player and ball position, shot types, winners, forced and unforced errors. Analyzing is possible in the form of a variety of records, graphs or the court statistics. Everything can be filtered in details even for the single-shot type or court location. Since the application is not dependent on an Internet connection, it can be recorded and analyzed really anywhere. Finished analyzes can be saved and exported for the further discussion. 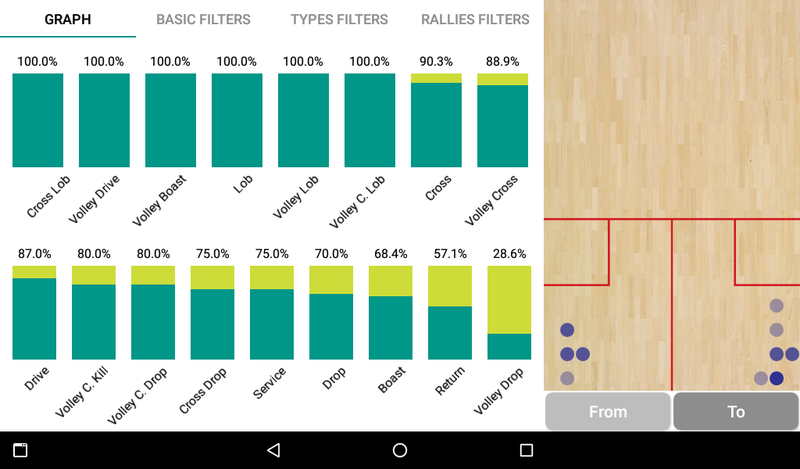 The application allows countless settings and filters for effective game analysis. Everything can be set from the tablet screen. Everyone loves working with the fast and simple app. The Coach Profi package will be cheaper by some percentage for each further player added. More details you can find when choosing the type of your plan in the app. If you are interested in club, school or association package, contact us for a special offer. The application can be tested for free in full version for 30 days. We are a progressive team that focuses on creating applications targeting on data analysis and processing. In the field of sports, there are a number of possibilities how to help players and coaches not only with the analysis of sports performances but also their use in the training process and follow-up competitions. 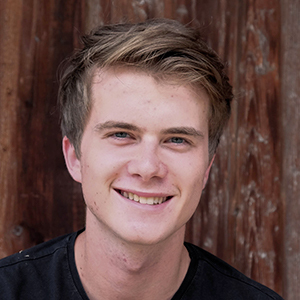 Co-founder and chief of the application development. A person responsible for SquashTrack project. Practised IT technology expert and fan of the racquet sports. 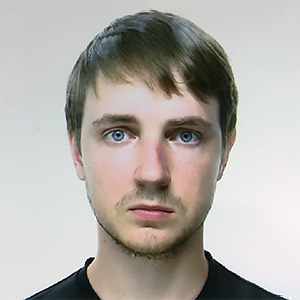 The main programmer of SquashTrack project. 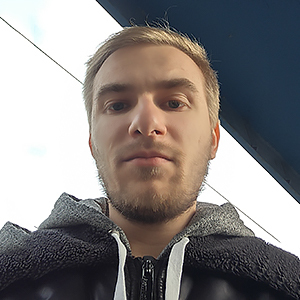 Mobile-app programmer expirienced with a software development and also a student of software engineering. Company soFair representative. A software company focusing on a development of REST API and sophisticated web applications. More details on sofair.cz.